Fab-Seal Industrial Liners, Inc., has been in the business of designing, fabricating, and installing flexible tank and cistern liners for a wide range of industrial uses for 30 years. Fab-Seal blends of thickness of PVC membrane for most containment applications, providing excellent resistance to inorganic and alkalis, in addition to a wide range of other corrosive materials. 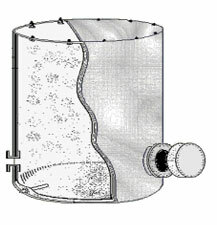 Cistern liners are ideal for updating your cistern storage tank. They are custom built to fit the size of your tank, which creates a water-tight system to prevent leaks through the storage process. The cistern liners available at Fab-Seal Industrial Liners, Inc., will give your tank a longer life span and increase your storage capabilities for your tank. Our blends of flexible PVC membranes for cistern liners have excellent resistance to inorganic and alkalis, in addition to a wide range of other corrosive chemicals. The experienced and trained industry experts at Fab-Seal custom-fabricate one-piece cistern liners in our state-of-the-art factory using the art of radio frequency sealing technology. The cistern liner saves most of the down time experienced with applied coatings and on-site fabrication. Call 800-874-0166 today to speak to one of our knowledgeable industry experts to discover how Fab-Seal Industrial Liners, Inc., can handle your cistern liner manufacturing and installation needs. Fab-Seal Industrial Liners, Inc., offers three decades of expert design, fabrication and installation of cistern liners. Our cistern liners are manufactured with extreme compatibility to most inorganic and corrosive fluids, and come with a proven, cost-effective approach to installation. Even our largest tank and concrete cistern liners can be installed in under a week, and at a price to fit your budget. Fab-Seal’s internally fitted, mechanically held, flexible membrane cistern liners system will save down time, in addition to the cost of preparation for installation. Call Fab-Seal Industrial Liners, Inc., now at 800-874-0166 to find out how our industry professionals can handle your cistern liner manufacturing and installation needs. Or click the Request a Quote button to the right and one of our qualified representatives will respond to your inquiry shortly. Have a question about Drinking Water Liners? Contact a Fab-Seal representative, complete the form below. Highest Quality PVC membrane lining.